On August 8, 2012 I received a wonderful email inviting me to create a quilt for the Paul K. Longmore Institute on Disability at San Francisco State University. This honor brought with it many questions. What purpose would the quilt serve? Where would it hang? What focus? Who would be the audience? The quilt project is intrinsically tied to Paul. His unexpected death created the reason SFSU permanently established the Institute and named it for him. Many of us involved in the quilt had strong personal ties to Paul. Should the quilt be a memorial to him? Should it include his vast collection of disability political t-shirts? The quilt discussions became an opportunity for us to discuss our fondest memories of Paul and to explore which aspects of his legacy we wanted to immortalize in the quilt. Although Paul died four years ago, his former students still attend SFSU and his mark on the campus is strong. Paul’s international mark on the field of disability history is rooted in the classrooms at SFSU where he led many explorations of how disability and history intersect. His answer: everywhere. SFSU also hosted several important milestones in Disability Studies: 2000 NEH Institute on Disability Studies; 2000 Symposium on Disability, Sexuality and Culture; 2002 Queer Disability Conference; and 2008 Disability History Conference. After many discussions with the Institute Director, Catherine Kudlick, and Eugene Chelberg, Associate Vice President for Student Affairs, an initial direction emerged. The quilt would hang in the Institute’s library and conference room with a direct sightline from the entrance of the Institute. The large surface, 4 by 6 feet, provided an open canvas. Paul’s deep interests in disability history, activism and culture emerged as the guiding representational themes. 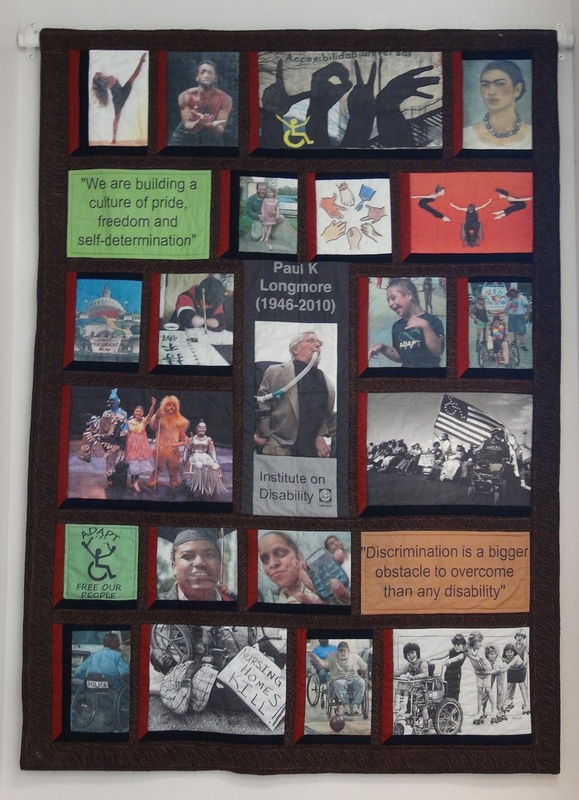 In addition to capturing Paul’s interests, the quilt needed to support the Institute’s mission to create opportunities for unexpected conversations, for making new connections, and for bringing all people's diverse relationships to disabilities into the room. The breadth of these goals soon outgrew one quilt so we created two. The Windows Quilt offers a peek into the diversity of disability communities. Consisting of sixteen photographs, three graphics, two quotes from Paul and a portrait of him at the center, this quilt uses a classic quilting technique called Attic Windows. These images represent slices of disability past, present and future. Each image opens opportunities for discussions. In one image, Deaf students hold up a “Deaf President Now” banner in front of the U.S. Capitol. Why did the Deaf students shut down Gallaudet University until the Board of Trustees selected the first deaf President? Just the way I wrote that sentence opens up discussions. People who have hearing impairment and who identify as part of the Deaf community, use the capital Deaf usage to show their cultural affiliation. This protest builds upon the U.S. history of underrepresented people fighting for representation in public leadership positions. Yet this is the first time that most Americans became aware of the issues. How is that protest relevant to the history of deaf people? To the struggle to prevent American Sign Language from disappearing? To students sitting in the Longmore Institute today at SFSU? Some stories, while compelling, did not make it onto the quilt. Stories such as the long and tragic history of institutionalizing people with physical and mental differences; the deaths of thousands of people with hemophilia from tainted blood supplies and the ongoing poisoning of the next generation with the hepatitis virus; the struggle between people with disabilities and the nondisabled people who “speak for” them; the parallel struggles of the HIV/AIDS communities and other people with disabilities; and so many more. The quilts, at their best, merely begin the discussions. The work of the Longmore Institute provides many opportunities to deepen and expand those discussions and to initiate ones not yet imagined. Each of the two large quilts, the Windows Quilt and the T-shirt Quilt, reflect and honor the work of Paul K. Longmore and his specific connection to SFSU. As with all creative projects, many people worked together to create these amazing quilts. Babette Schmitt provided many artistic insights, found obscure images after the rest of us gave up, kept our spirits up during late night sessions, and made the work feel effortless. Cathy Kudlick provided a clear direction, brought diverse and needed resources, and carried Paul’s spirit throughout the project. Graphic designers shaped the design and made our images useful, most notably Terri O’Hare and Alex Ho. Quilter extraordaire Melissa Quilter lent her nimble fingers to the ever-growing project. I provided the metaphorical rubber bands that held us all together throughout this exciting and challenging project. I hope that you enjoy these quilts as we honor and continue the work of Paul K. Longmore. He changed the landscape of disability history and SFSU. He is missed. Beginning at top left: A light-skinned female dancer wears a sleeveless, thigh high black dress. Her body is without arms. She leans her head back and kicks her right leg high into the air, toes pointed, while her left foot rises onto her tip-toes. Her long dark curly hair hangs down her back as her face looks upwards. Behind her a thin, white curtain falls down to the ground with a strong light behind it. Block 2: Oakland based Deaf performer and dancer Antoine Hunter leans forward, forearms reaching, hands touching with fingers open and reaching. Antoine's dark African-American skin shows strong dancer's muscles, particularly in his arms and shoulder. He is wearing a red tank top, black pants, a necklace with an oval white disk with two holes in it. He appears to be in his late 30s, has a dark moustache and beard, and a short afro. He faces the camera, looking slightly above it. Block 4: A close-up self-portrait painting of Frida Kahlo, the 1933 "Self-Portrait with Necklace." Frida is a medium-skinned Mexican woman with dark bushy eyebrows and a faint moustache over lipsticked lips. Her dark hair is pulled back into a braided bun at the base of her neck. She wears a white blouse with lace trim and a necklace of pre-Columbian jade beads. Block 6: A light-skinned man (apparently a father) kneels down next to a young, light-skinned blind girl, approximately 6 years old (apparently his daughter). She holds a white cane in her left hand. The background is a garage and driveway. Block 7: Illustrated images of 7 different hands, including 5 hands belonging to different ethnicities, a dog paw, and a hand with a hook. All of the hands are forming a circle making different hand shapes including the American Sign Langauge "I love you". Block 8: Three members of Axis Dance Company strike a stunning pose; the center dancer, Bonnie Lewkowicz, as a light-skinned female wheelchair rider, opens both arms out to her sides. The other two dancers, both light-skinned women, leap back to symmetrically frame the center person. They both are bent at the waist, toes pointing towards Bonnie, arms stretched backwards with fingers pointing away from Bonnie. All three dancers wear black tank tops and black pants. Bonnie wears black shoes, the other dancers are barefoot. This photo is by Margot Hartford of a rehearsal of the Axis Dance Company production of "Fantasy in C Major," a 2000 dance choreographed by Bill T. Jones. (ROW 2) Block 9: Image of the Capital in Washington DC with a large banner reading “ DEAF PRESIDENT NOW.” Behind the banner are supporters of this cause holding three vibrant waving flags; blue, yellow and red. Block 10: An Asian woman has extensive burns on her face and her forearms are amputated six inches below her elbow and have burn scars. Her face stares intently towards the caligraphy paper where she draws the apparently-Japanese characters. She holds the long bamboo brush between her arms. She has short dark hair and wears a black shirt covered by a read sweater and a black smock. On the table are an ink well, some completed drawings and a lock that is holding down the edge of the drawing paper. Block 11: The centerpiece image of this quilt is a photo of Paul K. Longmore (1946-2010). Paul, a grey-haired, middle-aged white man, leans forward in his wheelchair. He wears a black turtleneck shirt and a dark grey suit jacket. He holds a ventilator hose in his mouth as he stares intently forward. Block 12: A light-skinned young person approximately 15 years old stands at the beach wearing a black tshirt with a large teal wave design and the words "ADAPT SURF". They are laughing with mouth wide open, hands raised up and smiling eyes. They have thin wet short medium brown hair. Block 13: Three white people surround a recumbant tricycle that holds a sign that reads “Pride Revolution: Chicago Disability Pride 2010.” In the center is a painting of a red heart with a yellow raised fist. Eli Claire, author from Vermont, rides the recumbent bike. His feet are up on the pedals, he wears a sleeveless black tshirt, black shorts, a few tattoos, a black bowler hat, black-framed glasses and a large rainbow paper flower lei. To his right (left in the photo) stands Riva Lehrer, artist from Chicago, wearing a black tank top, green shorts, high-top black boots with rainbow shoe laces, a red purse with the strap slung across her chest, dyed red hair with a front forelock of grey. To Eli's left (right in the photo) is Samuel Lurie, a social worker from Vermont, who wears a white tshirt, blue jean shorts, black sneakers, a very large rust-colored floppy sun hat, and a matching rainbow lei. Block 14: Phamaly Theatre Company (formerly known as The Physically Handicapped Actors & Musical Artists League) performs the Wizard of Oz. In this photo (from left to right) the Scarecrow is a deaf actor in a very blue costume and makeup, Dorothy is a young light-skinned blind woman who's black lab guide dog plays Toto, the Cowardly Lion holds up a white blind cane, and the Tin Man is a female actor using a wheelchair. Block 15: A Tom Olin photograph of a disability rights demonstration: A crowd of people of many different skin tones, mostly all in wheelchairs, form a long line side-by-side facing the camera. One holds a protest sign that reads "Redirect 25%" while another person hold a large flag similar to the American flag but with stars making an outline of a person sitting in a manual wheelchair. Block 16: The logo of the organization ADAPT, which assures the civil and human rights of people with disabilities to live in freedom. This image is a rendition of the universal disabled image of the person in the wheelchair but the figure's arms are raised in fists and the chain that attached the two wrists over the head is now broken. The image is printed on green fabric. Over the figure is the word "ADAPT" and under is the phrase "Free Our People." Block 17: A 50 year old African-American woman, Deborah Dixon aka Dix, with a non-apparent disability smiles with pride, wearing her Bachelor's graduation garb. Block 18: A medium-skinned blind woman shows her cell phone to the photographer, revealing the braille on its keys. Block 20: A dark-skinned man wearing a police uniform of blue long-sleeved shirt and black pants pushes his manual among parked cars. On the back of his black wheelchair is a large white sign with black letters that says "Police." His smiling face is turned to the right. Block 22: A group of disabled veterans bowling together. In this photo, the man in front is a light-skinned man in a red manual wheelchair who has just released the bowling ball. He wears a tan tshirt with the words "Home of the Free," a khaki baseball cap and blue jeans. Behind him is a dark-skinned man wearing glasses with a blue tshirt and blue jeans in a blue manual wheelchair. Block 23: This pen-and-ink drawing shows a line of children moving together. Leading the group is an Asian-appearing young woman wearing a plaid jumper and sweater riding with white socks and shoes in a rear-wheel drive Everett & Jennings power wheelchair with a tray top where her arms are leaning as she drives forward intently. Holding onto her chair is a light-skinned child about the same age wearing a dark tshirt, dark pants and dark hair with roller skates. Holding on next is light skinned child with a v-neck shirt, light shorts, white skates and shoulder length blond hair. The fourth child is light-skinned and blond wearing a long-sleeve shirt with the sleeves rolled up to the elbow and blue jeans with dark skates. The fifth child, a medium-skinned girl, has dark hair, white skates, wears a light tshirt and dark skirt. The final child is light-skinned, medium-blond hair, wears a dark tshirt, blue jeans and dark skates.